First of all, let me tell you how much I value your DWCS6 Training video. You did a wonderful job — I’ve listened to it over and over again. Now for my current question. I am creating a responsive-design website for a client who has a number of audio demos on her “on-hold demos” page. I cannot figure out how to add audio file in CS6. Do you have a training video or other reference that will help me? It’s best to host sound on a third-party service, like SoundCloud, and then just copy the code into your Dreamweaver site. Small and large companies use third-party services for video and audio hosting. For video, many use YouTube or Vimeo, but for audio, you might consider SoundCloud. The web startup SoundCloud has figured out a way to defeat the pirates, allowing site owners a free and easy way to share their Dreamweaver creations. The site includes tools that allow your friends or contacts to comment on specific portions of your audio file that they like and to easily share opinions with others. You can upload, embed, and promote your audio files through Facebook, Twitter, Tumblr, and Google+. Open a browser and navigate to SoundCloud. 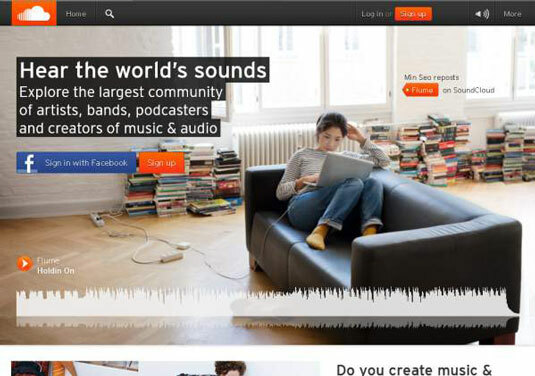 The SoundCloud home page opens. Click the Sign Up button. A window opens, allowing you to sign in using your Facebook Profile ID or your e-mail address. If you’ve already signed up for an account, choose the Log In tab at the top of the Sign Up dialog box and sign in. Follow the site’s instructions for uploading your audio file. SoundCloud allows you to choose the genre for your audio file (such as a podcast interview or a work-in-progress guitar solo) and type tags so other people can discover your audio file as well. After your file has been uploaded, you can choose to publicize it and share it with friends by posting the file’s SoundCloud link on Facebook, Tumblr, Twitter, or Google+.